A prominent Muslim American political activist is included on a list of 75 terrorists issued by a Libyan parliamentary committee. Esam Omeish is a former president of the Muslim American Society and remains a prominent figure at the Dar al-Hijrah mosque in Falls Church, Va. He is among 75 people the Libyan House of Representatives' Defense and National Security Committee labeled Friday as enemies. Libya's government remains fragmented, with the House of Representatives based in a city called Tobruk. It is considered closely aligned with Egypt. Omeish is the 29th name listed on the terror list and is described as an "international member of the Muslim Brotherhood." Another American, Aly Abuzaakouk, appears just after Omeish's, also identified as an international Muslim Brotherhood member. Omeish blasted the move in a statement on his Facebook page, saying "my name had unjustly and falsely been placed on a so called list of supporters of terrorism." He protested Saturday to Virginia U.S. Sen. Tim Kaine, the 2016 Democratic vice presidential nominee, and plans to try meeting more members of Congress today. Omeish wants the committee's leader "legally prosecuted for fraud, slander and defamation to obtain a judgement inhibiting their ability to travel to America..." He also wants penalties for committee members who approved the list, accusing them of "randomly charging American citizens who have no offense or crime, or involvement with any of the forms of terrorism, and who are major in the American landscape in the fight against terrorism and working with all security and legal agencies to preserve the country's security and the safety of the society and communities with transparency and integrity which everyone near and far knows." Omeish formerly served as president of the Muslim American Society (MAS), which insiders have acknowledged is the Muslim Brotherhood's overt arm in the United States. In a December Facebook comment, Omeish wrote that Muslims "have not known of the people of Islam ... those more just in understanding, wider in approach and closer in application than the Muslim Brotherhood. We have not known of humane brotherliness and its people, (and we are affiliated with all men whom Allah has created a propensity for love, mercy, an upright disposition, good morals and honorable character) better in ethics, of gentler parts, deeper in adherence to duty, nobler in morals among all their sons, and every one of their actions than the Muslim Brotherhood." Last year, he advocated that the U.S. support for a group known variably as the "Revolutionary Shura Council," or the "Mujahideen Shura of Derna," despite ties between its officials and al-Qaida. Egypt's air force bombed the group last month in retaliation for terror attacks against Coptic Christians in April. Abuzaakouk also has deep Muslim Brotherhood connections. He has served as executive director of the American Muslim Council (AMC), and publications director for the International Institute of Islamic Thought (IIIT). He became foreign minister of the Muslim Brotherhood-dominated Government of National Salvation based in Tripoli after dictator Muammar Gaddafi fell. That group opposes the internationally recognized government in Tobruk. The AMC was founded in part by Mahmoud Abu Saud, who helped Hassan al-Banna create the Brotherhood in Egypt, the Washington Post reported in 2004. FBI officials have long suspected that the IIIT housed leading Brotherhood officials in the United States. 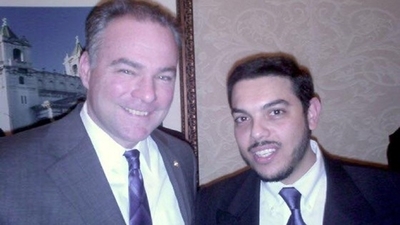 Despite his overt support for "the jihad way" and for the Brotherhood, Omeish has been close to Kaine for at least a decade. When Kaine was Virginia's governor in 2007, Omeish was forced to resign from a state immigration panel after Investigative Project on Terrorism video showed him praising Palestinians during a 2000 rally for knowing that "the jihad way is the way to liberate your land." At a separate event two months earlier, Omeish similarly praised Palestinians "for their bravery, for their giving up their lives for the sake of Allah and for the sake of Al-Aqsa [Jerusalem]. They have spearheaded the effort to bring victory upon the believers in [Palestine]." It was during a 2010 fundraiser for Omeish's state assembly campaign that U.S. Rep. Keith Ellison – now the Democratic National Committee's vice chair – complained that Israel unduly influence U.S. policy in the Middle East. "A region of 350 million all turns on a country of 7 million," Ellison said. "Does that make sense?" Ellison added: "We can't allow another country to treat us like we're their ATM. Right? And so we ought to stand up as Americans. Now some of us have affinity for other places around the globe. Some of us are new Americans and adopted America as our home. But whether you're born here or whether you accepted America as your own voluntarily, this is our home. Right? All of our home equally, and we can't allow it to be disrespected because some, by a country that we're paying money to." In this case, Kaine serves on the Senate Foreign Relations Committee's subcommittee for North Africa. It is unclear what impact the Libyan House committee's terror list will have, especially among U.S. policy makers. There's no public information indicating Omeish was directly involved in any terror support. But he has openly advocated for "the jihad way" and lauds the Brotherhood, a movement which articulated a goal of creating a global Islamic state and serves as an inspiration for Sunni jihadist groups including al-Qaida, Hamas, Palestinian Islamic Jihad and Ja'amat Islamiya. "The common link here is the extremist Muslim Brotherhood – all of these organizations are descendants of the membership and ideology of the Muslim Brothers," former National Security and Counter-terrorism Coordinator Richard Clarke testified in 2004 before a U.S. Senate committee. There are twin bills pending in Congress that would designate the Muslim Brotherhood a terrorist group. The United Arab Emirates has already done so.